I am not a fan of purchased canned tomato sauce, but it takes time and thought so I will use it when I need to, but I taste the dish as I add it in increments to avoid the strong, somewhat off-putting flavor produced when too much of it is used. There is no comparison to home-made sauce and hopefully with today’s method and the “back to the garden” movement currently in full swing, more will begin to enjoy the flavor of the real deal. The quality of tomato sauce is a debate that has been waged for over a century as noted below. “What is called Tomato sauce in this country is only a libel on the real article. Vinegar, in quantities more or less large, and cayenne pepper are used in the preparation of it, and, as might be expected, these things overpower completely and kill that pleasant acid taste, quite sui generis, to which is mainly due the great charm of the Tomato. In some shops you can buy preserved Tomato sauce made in France, and this will be found very good if it is really of Gallic origin, a fact easily ascertained by opening a bottle and tasting it. If it tastes of Tomatoes it is good French Tomato sauce; if the compound is very acid and hot to the mouth – in other words, if vinegar and cayenne predominate—then it is the British form—to be avoided. Good French Tomato sauce, however, is not very cheap; and as Tomatoes can be bought in London—at a certain season of the year—at a very moderate rate, those who choose to take the trouble can provide themselves with a sufficient stock of good wholesome Tomato sauce, if they will attend the following directions. To ensure perfect success the Tomatoes should be gathered quite ripe on a bright sunny day, about one or two o’clock in the afternoon. Those who have no garden to grow Tomatoes in, or, having a garden look out in vain for a bright sunny day, must manage as best they can. Cut up the Tomatoes into quarters, and put them into a saucepan with salt quant. Suff[icient], a good handful of Basil, and three or four cloves of Garlic. A little water should be put into the saucepan to prevent the Tomatoes catching. When they are thoroughly done, turn them out upon a hair sieve, and wait till all the water has drained from them. Throw away this water, and proceed to pass the Tomatoes through the sieve. The pulp thus obtained is put into a saucepan to boil for about half an hour, and a moderate quantity of black pepper may be added to it according to taste. When the sauce is quite cold put it into wide-mouthed bottles, cork tightly, and tie up each cork with string or wire; dip the neck of each bottle into melted rosin, and you may put them away to be used when required. The bottles should be of moderate size, for, once opened, the sauce will no longer keep good. If, before putting on the wire, the bottles of sauce are placed upright in a large vessel of cold water, and this is put on the fire until the water boils, the preservation will be more certain still, and the sauce will keep good any length of time. Care must be taken, however, not to remove the bottles from this ‘bain-marie [a type of double-boiler] until the water has become perfectly cold. Another way consists in letting the Tomato pulp reduce in a sauce-pan until it assumes the appearance of a very thick paste—car being taken to stir it constantly; when cool it is put away like jam in pots, and will keep any length of time. This is what is called ‘conserva’ in Italy, only in that country the Tomato pulp is reduced to the consistency of a thick paste by the action of the sun instead of that of the fire. To use the conserva a small quantity is dissolved in water. It makes very good sauce, but the taste is different from that of the fresh Tomato, or of the preserved sauce, described above. The article went on to suggest using fresh herbs (parsley, basil, marjoram, thyme, and laurel leaf with garlic or shallot) – “The Garden”. Oct. 19, 1872. I will share this one for comparison, notice the early date. TOMATO SAUCE. “The Southern Agriculturist”. Vol. 8. Nov. 1835. Parboil the ripe Tomatoes until the skin will slip; peal [sic] and mash them; and add to every pound of the Tomatoes one ounce of butter, season with salt and pepper and simmer over a slow fire until perfectly cooked. Make the sauce with tiny ripe tomatoes (like grape or cherry tomatoes) – any kind you like (heirloom are best), yellow, red, or black to suit your fancy. To about a pound of tomatoes in a mixing bowl, pour over a couple of Tablespoons of good olive oil and toss to coat. Salt and pepper to taste. Roast in a 400 degree oven until the tomatoes are soft. Serve over pasta, in stews, or with anything that will benefit from the rich roasted flavor (perhaps baked fish, shrimp and grits, etc. or use for pizza sauce or to flavor gravy). Fresh herbs of choice, and garlic or shallot can be added. Blissful meals yall, – THF. Orange: Which Came First – the Fruit or the Color? Which came first, the fruit or the color orange? The answer depends on whether we are tracing the English word or the Sanskrit or Old French versions which predate the English translation by several centuries. The fruit was known early, but described generally as being “yellow-red” or “red-yellow” in color. The village of Orange in France was founded about 36 or 35 BC. It was named Arausio initially and the Principality of Orange was apparently named for that place and not for the color. The color was adopted by the House of Orange-Nassau after the sixteenth century, and the color began to be associated with Protestantism due to the afore-mentioned House of Orange siding with the Protestants in the French Wars of Religion (1562-1598) and the Dutch Eighty Years’ War (1568-1648). The word was absorbed into Middle English from the Old French and Anglo-Norman orenge during the 13th century and was used for the fruit. It was roughly another three centuries before the word came to mean the color of the fruit. The color may have come from the word naranja, (Sanskrit) or naranj (Persian). Let’s look quickly at the development of the word orange. Nathan Bailey defined it  simply as the fruit grown in an orangery, but orenges [sic] were said to be little “balls of an orange color”. As late as 1869 Noah Webster’s etymological dictionary defined orange as fruit and orangery as a place where oranges were grown. He made no mention of it as a color. In 1887, Chambers defined it as a fruit and a color composed of red and yellow. Finally, in 1900 Walter Skeat said the word derived from narenge, “but with the initial n lost (in Italian), and then arenge became orenge by a popular etymology from gold. Naranja – an orange – Ital. arancio, an orange – Pers. Naranj, narinj, narang, an orange. “ – “A Concise Etymological Dictionary of the English Language.”. The Orangemen or Orange Order is a Protestant fraternal society founded in Belfast in 1795/6 and named for William of Orange (Protestant) who defeated the Catholic King James II at the Battle of the Boyne in 1690. This was a very brief look at a broad topic, but those interested in more on the early history and etymology of the word can continue where I’ve left off. Let’s look at a few early mentions of the word in English. Christopher Columbus reportedly brought oranges to the New World in 1493 and by the mid-16th century Spanish explorers, probably Ponce de Leon, had orange trees planted around St. Augustine, FL. Jose de Acosta, 1590, wrote a page on the orange groves in the Indies. George Sandys documented oranges growing while touring France and Italy in 1610. Noah Biggs discussed the merits of oranges in 1651, London. Richard Ligon found orange trees as well as lemons in Barbados, 1673. The French Gardener, 1690, listed Bigarrades, China, Spanish, Genoa, Portugal, and Province oranges. In The Present State of Europe, oranges and orange trees in flower were set before King James and his wife, 1698. Richard Bradley documented the presence of oranges, lemons, etc. in English kitchens in 1727. 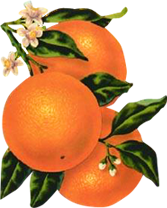 John Bartram and William Stork quoted a letter written from St. Augustine in 1765 saying oranges grew well in East Florida. 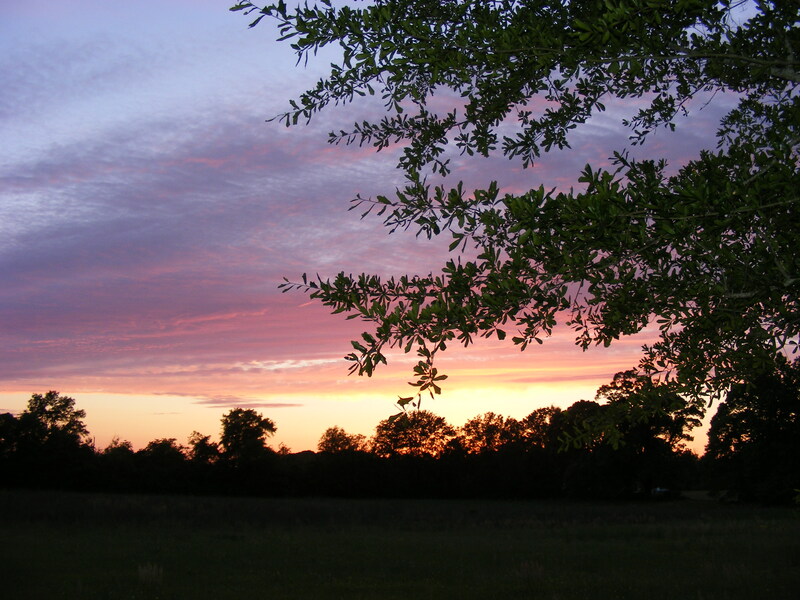 Thomas Ashe described groves of oranges in Louisiana and noted they, “thrive to the highest perfection”. – “Travels in America”. 1808. Both sweet and sour oranges were growing around Charleston, SC by the early part of 1800. – Guthrie, William. “A New Geographical, Historical and Commercial Grammar.” Vol. II. 1815. Philadelphia. Oranges from Florida were sold in the markets in Philadelphia by 1825/26 as noted by Karl Bernard. “Travels to North America During the Years 1825 and 1826”. Oranges were left in Christmas stockings because they were expensive, having to be transported long distances to most households. Receiving apples, oranges, and nuts was a tradition that carried over into my own childhood. My uncle bought a case of each every year. Eighteenth century cookery writers had various ways and means by which oranges were used. Below are a few simple early recipes. ZEST OF CHINA ORANGES. Pare off the outside rind of the oranges very thin, and only strew it with fine powder-sugar as much as their own moisture will take, and dry them in a hot stove. ORANGE CAKES. Take out the inside, picking out the seeds and skins; boil the rind till tender, changing the water; dry and chop it, put it to the inside; to one pound of this, one pound of sugar; boil it candy high, first well wetted; take it off the fire, stir in the orange, scald it: when almost cold drop it on plates. Dry the cakes in a stove. – Charlotte Mason. 1777. TO PRESERVE ORANGE-FLOWERS. Pick the flowers, and little oranges and stalks and put them in your glasses, but one in a glass just fit for them, and boil the syrup till it is almost a jelly, then fill up your glasses; when they are cold, paper them up and keep them in a dry place. – Charles Carter. 1761. 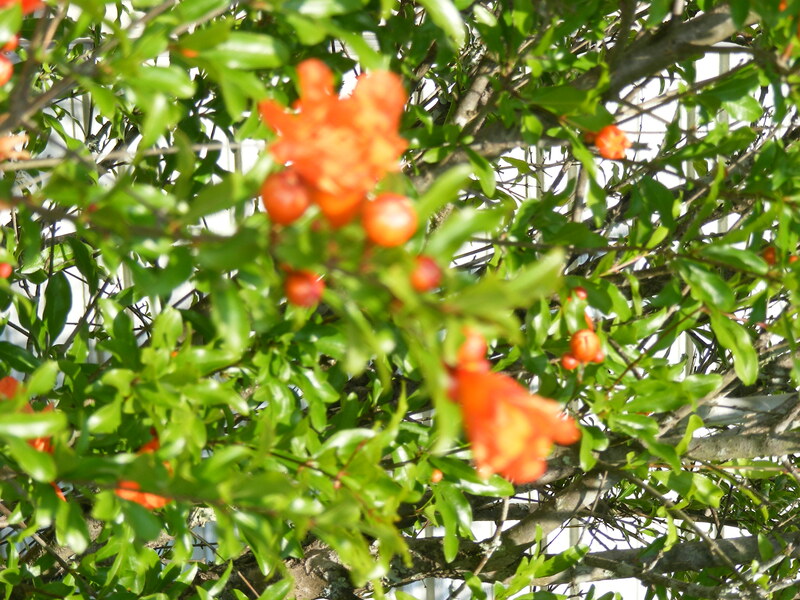 ORANGE SHRUB. Take two gallons of soft Jamaica rum, one quart of fresh lime juice, eight pounds of refined loaf sugar, consolidate them together, then add twenty-four sweet oranges, and twenty-six lemons cut up fine; in about two weeks it will be ready for use. This will make very delightful Punch. ORANGE COMPOTE. Is made without boiling the oranges; they are only to be peeled, cut in slices, the core taken out; add some syrup or sugar in powder, and the juice of an orange. William Jarrin. 1829. ORANGE AND LEMON WHIPT CREAM. Rub or rasp on a piece of sugar the peel of two fine Seville oranges; scrape off the sugar as it imbibes the essence, mash it very fine, and add it to your cream. Lemon cream is made in the same manner. Various authors gave recipes for orange marmalade, orange jelly, orange wine, orange brandy, orange shrub, etc. 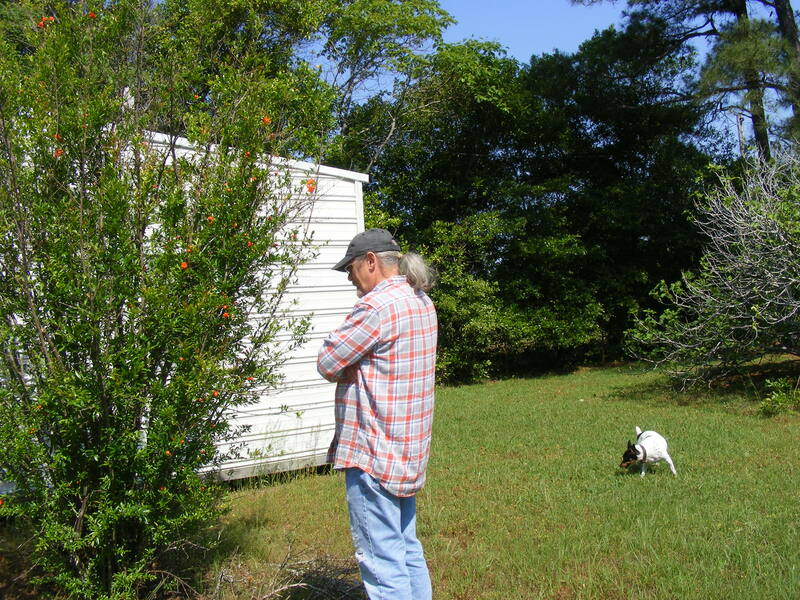 See a previous post regarding the early growth of oranges around New Orleans and Mobile. Blissful Meals, yall. – THF. 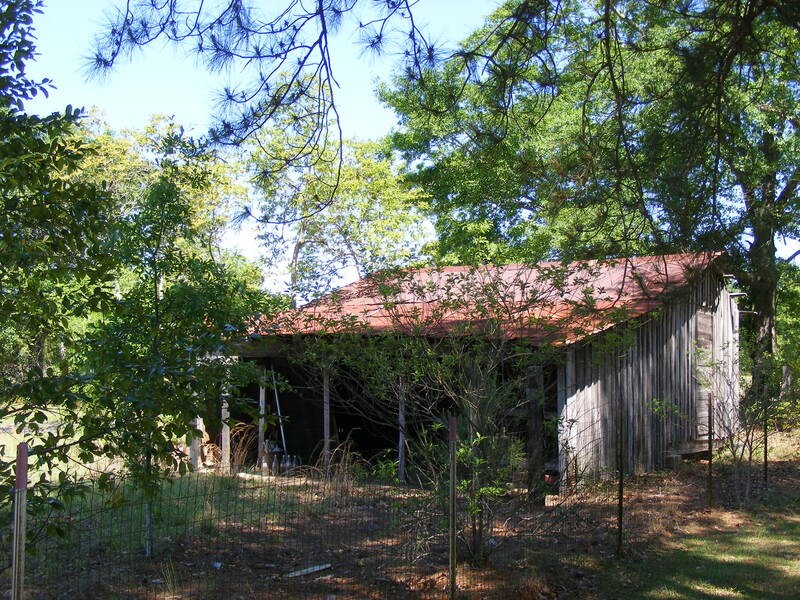 The old barn will get rehabbed to shelter my goats as soon as the inside work is done. Looking at the flowers on the pomegranates. Changing the kitchen counter top from pink to a neutral beige. 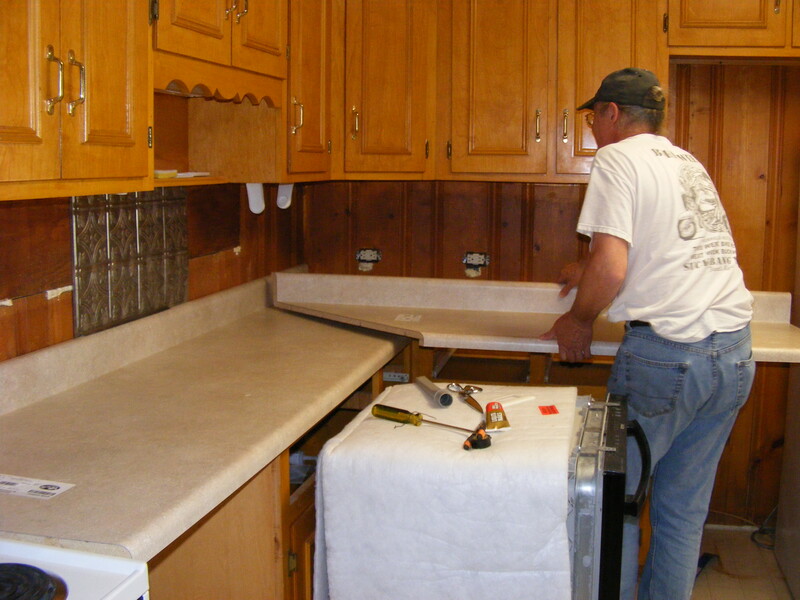 The tin panels we installed as a backsplash can be seen in one of the photos. 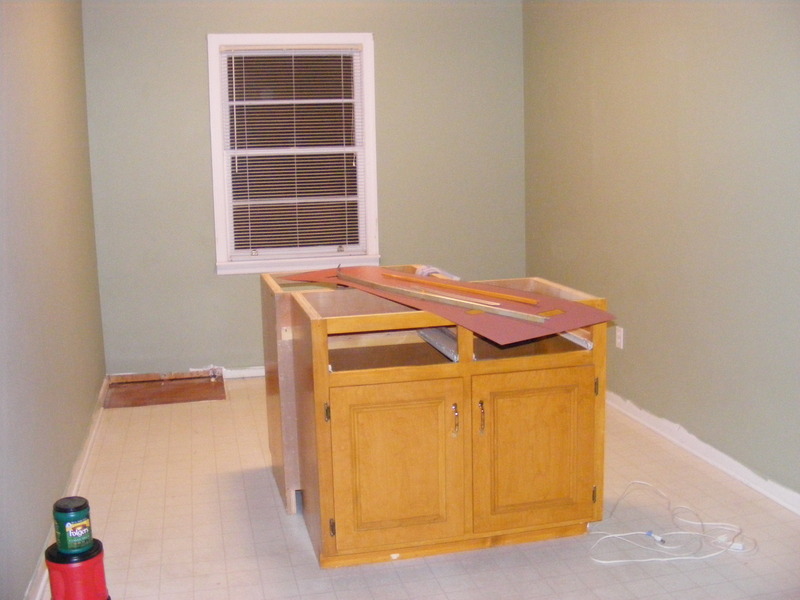 The dining room cabinets have been removed and the room painted. The trim has since been painted and the cabinets moved to the laundry room. The living room before with it’s pink carpet, and after removing the carpet and finding the hardwood underneath it. 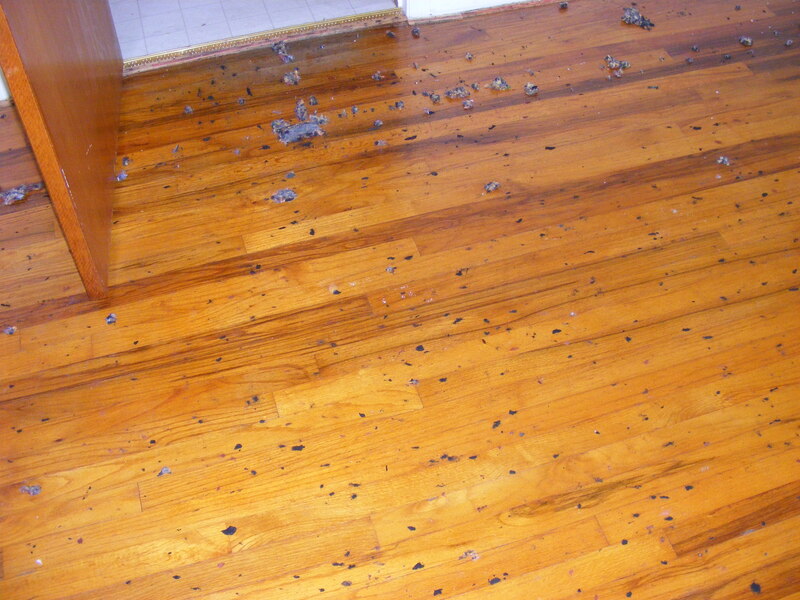 The black spots are where the carpet pad broke down over time. The chore this weekend is to remove all those spots. 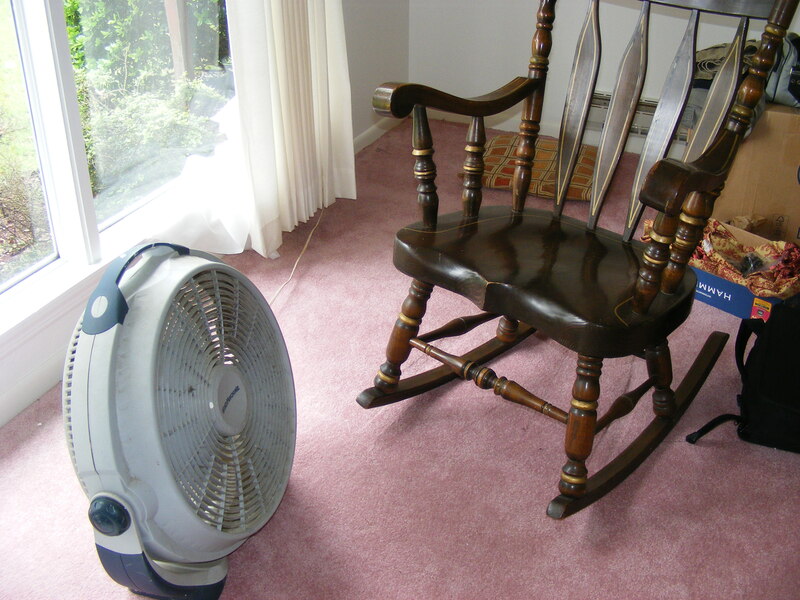 If they can be successfully removed this room will not require sanding like the bedrooms. Ripping up 50 year old tile from the hallway. 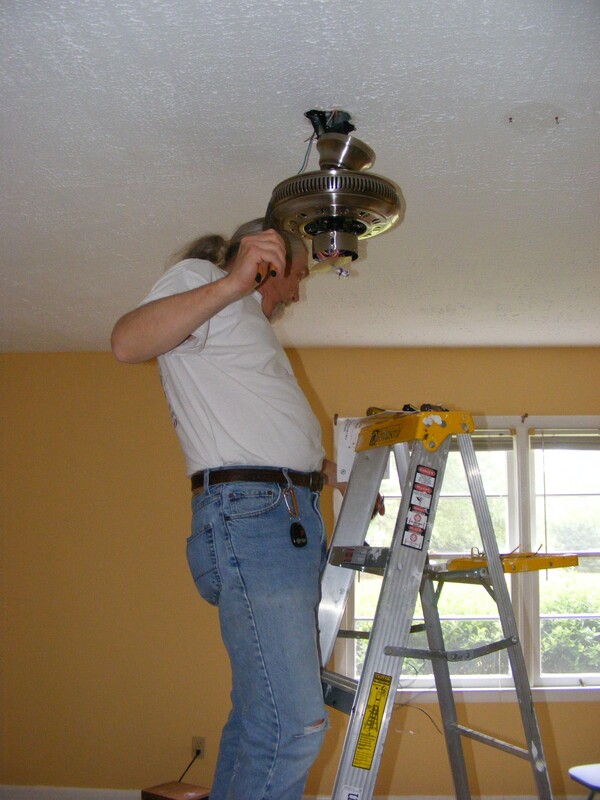 Installing a ceiling fan in the newly painted bedroom. Sanding the bedroom hardwood that was found under more aged carpet. 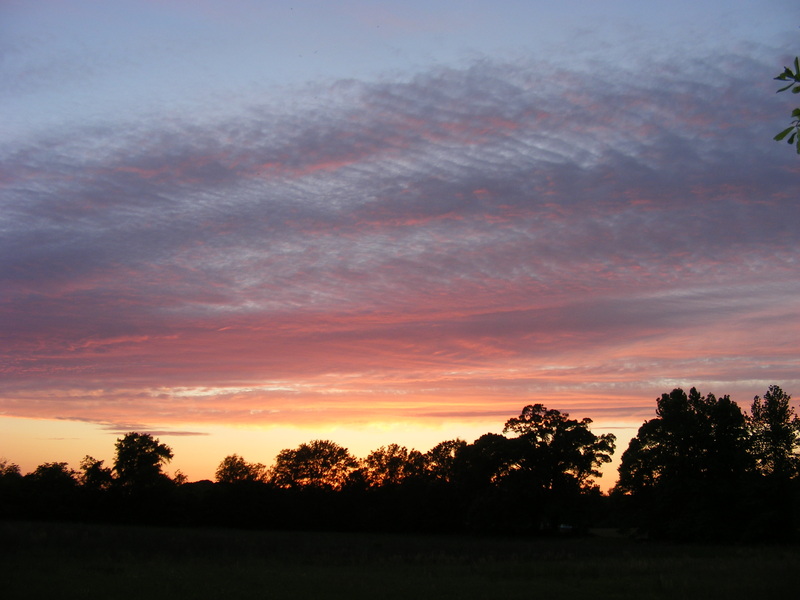 It is easy to see why we fell in love with the place – I hope to have a lot of years watching these sunsets with my sweetheart. The updating continues at a furious pace although we’re growing increasingly less energetic. I am not complaining because we can see an end to our labors on the horizon, and the home is going to be just what we want in every respect. By doing the work ourselves we know what went into it and it is not what some contractor slapped together that will last just long enough for him to make a hasty exit, check in hand. Martin spent last weekend sanding two bedroom floors, and because we couldn’t find the sander he wanted available anywhere in a rental, he used what we could find and it took twice as long as we expected. The wood underneath the old carpet is beautiful though and with a little more tweaking and finishing it will be as beautiful as the day it went down. While he worked himself to death on the floors, I pulled the weeds in a large bed, and spread 10 bags of mulch on the top of what was already there. Weeds, be gone!!! 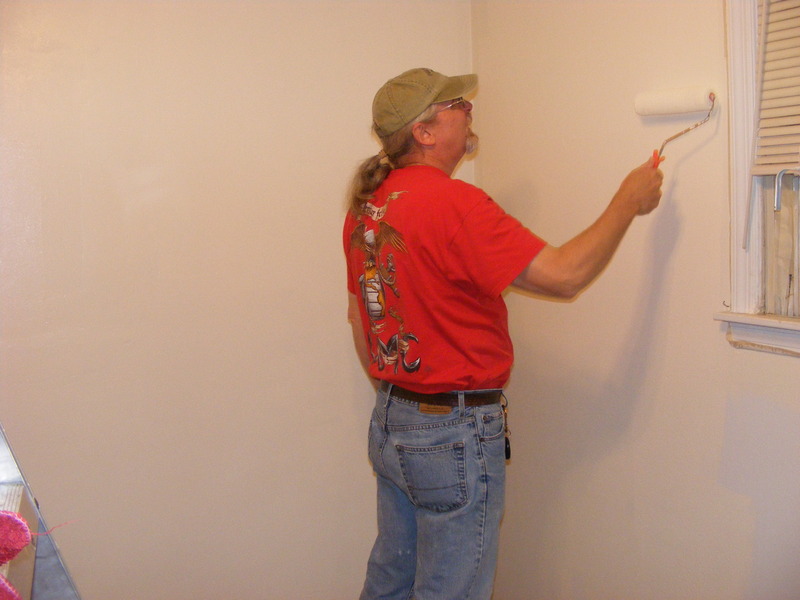 Once that was out of the way, I pulled out the painting supplies again and went to work on trim and bathrooms. I painted the window, window and door trim in the dining room, I painted the guest bath and all the trim and cabinets in it, and then I painted the vanity, inside and out, closet, and all the drawers from the master bath. Everything looks so nice and clean!!! This weekend I plan to paint the walls in the master bath while Martin continues to work on the hardwood flooring. Once he’s finished sanding in the two bedrooms, I will paint those windows, trim, and baseboards, and guess what???? There will be no more interior surfaces left to paint, and installing porcelain tile in the hallway, living room, and kitchen will be the end of the flooring projects. Woohooo! 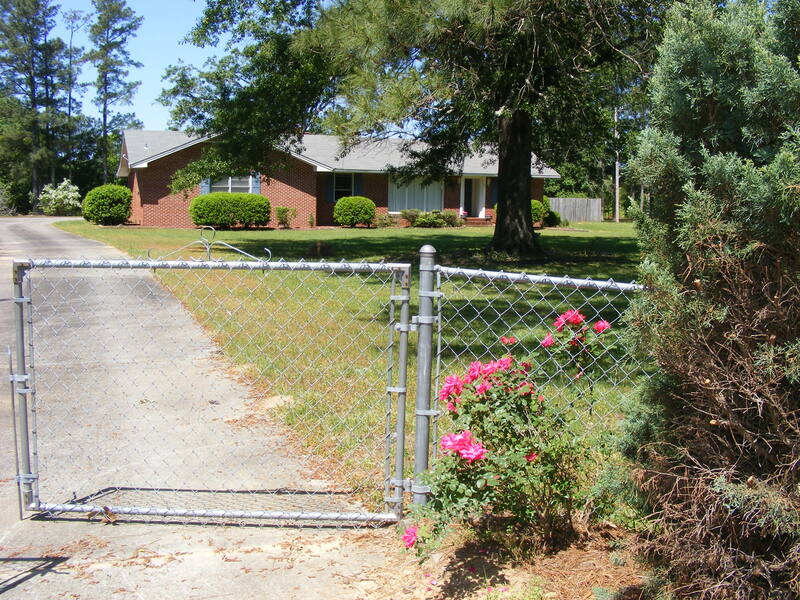 I bought pink and red Knock-out roses to put in the flower bed in front of the house to replace the raggedy boxwoods. I never cared for boxwood and couldn’t resist an opportunity to replace them with the roses that will provide color from spring to frost. I have a day off work coming up and I plan to use it to make living room drapes. It took me weeks to find just the right fabric, and fortunately it was on sale for 40% off. It was still pretty pricey, but much less than ready-made drapes. (Those high school Home Ec classes have sure come in handy over the years). The fabric is gold, a touch of the sage green from the dining room, and rust plaid which will go nicely with the gold area rug with vegetable dyed light floral design we already have. I’m headed back to Ross for another extra-long curtain rod. The one I bought for the master bedroom was $19.95 there, compared to around a hundred bucks from department stores, overstock.com, or amazon.com. The following newspaper article gives a good account of fruits and vegetables being exported from the U.S. during the WWI era and how the government controlled such exports once the war started. We can tell from the article what food crops were grown for commercial use and it’s pretty impressive that such perishable commodities were successfully transported long distances when during the last major war civilians and military alike suffered for want of food in one area when it sometimes went to waste in another because of an inability to transport it where most needed. “Perishable Exports. War Trade Board Announces List of Expeditable Articles. The War Trade Board, created by President Woodrow Wilson, was authorized by executive order on Oct. 12, 1917 under the authority of the Trading with the Enemy Act (Oct. 6). The board controlled both imports and exports during WWI. They determined what goods went out of the country, what came in, and what countries it came from or went to. Board members were selected from representatives of the secretaries of state, treasury, agriculture, commerce, and the food administrator and chairman of the U.S. Shipping Board. On July 1, 1919, another executive order placed the duties and functions of the board under the jurisdiction of the Department of State. That Oct. 6th, 1917 law was the Trading With the Enemy Act which prohibited American merchants from trading with the enemy or the ally of an enemy without first obtaining the license mentioned above. They published the “Enemy Trading List” for the use of those merchants so that they were at all times held accountable for their actions in transporting goods to or from other countries. The hope was limiting an enemy or ally of an enemy’s available capital which might be used against the U.S. and her allies in the war effort. The scope of activities that were controlled by the board is staggering, such as flushing out foreign interests within the U.S.
[See: “War Trade Board Journal”. Vols. 14-23. Nov., 1918-July 1919. “Report of the War Trade Board. Washington. 1920]. The place we’ve bought has two pomegranate trees, or more appropriately, bushes, which are beginning to bloom with the most beautiful blooms one can imagine. There were those in the early part of the 18th century who agreed with me that they are worth growing for their showy blooms even if one has no interest in the fruit, although I do actually. “…the beauty of the flower that is most to be considered…”. That writer instructed methods of propagating them, including layering of pomegranates. “Take such a branch, prune it as much as you think convenient, and so, that what is to be laid in the ground may be quite clean; lay that Branch in a little trench or furrow made for it: fasten it down with a wooden hook, cover it with earth, and water it: After that stay six months before you examine it, then see whether it has taken sufficient root to be cut off from the trunk from whence it grows, and to be transplanted to the place you have design’d for it”. 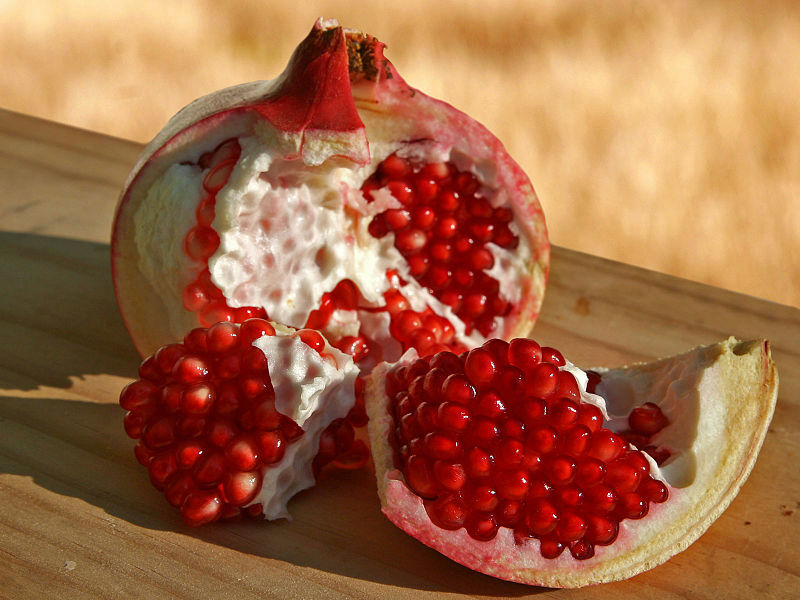 There are numerous accounts regarding the healthful benefits of pomegranate flowers, bark, and juice throughout the 17th century and it is also found in Biblical writing, the works of Shakespeare, etc. 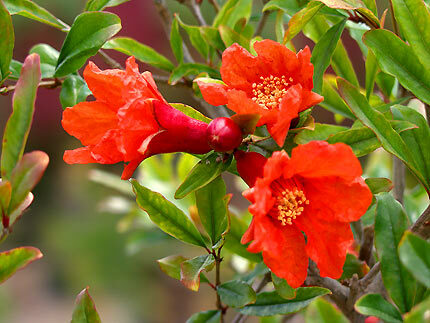 The brilliant color of the blooms is so distinctive that “pomegranate” was used to describe the color as found in other aspects of nature. In 1804, John Barrow recommended using pomegranate for a hedge, and as the limbs are thorny, it would likely be efficient at keeping out anyone or anything one desired to keep at a distance. It only took one attempt at pruning the bushes for me to develop a healthy respect for the thorns. When grown in the U.S. it was first grown in the Gulf States and California although it can be found in many states today. The fruit was used to decorate banquet or home dinner tables, and mentioned in that regard in various magazines and Bulletins. The seeds and juice were used in salads, cocktails, punches, and “fancy dishes”. The fruit kept well over long periods of time and home storage was thought to improve the flavor. Food writers warned against using iron utensils while making juice from the seed. The brilliant purplish-red juice was used to color a variety of foods. Apples and pears colored with pomegranate juice made them more visually appealing for salads. The bark and flowers have been used to dye fabric, and the rind was used to make a dark black ink. Let’s look at how the fruit was served in the early 19th century. COMPOTE OF POMEGRANATE. 1 dozen pomegranates; ¾ pound of sugar; ½ cup of water; 1 Tablespoonful of orange juice. …carefully remove all the bright ruby pips, without bruising them. Throw these into a dish. Make a syrup, flavored with orange juice, pour it over them and serve. Pomegranates are often found in salads or vegetable dishes today such as the roasted Brussels sprouts with pomegranate seeds and toasted walnuts served in Bobby Flay’s Vegas restaurant. For a salad combine spinach leaves, walnuts, feta cheese, seeds from 1 pomegranate, and dressing of choice, preferably a vinaigrette. To mix it up, use any type greens or nuts, bean sprouts, pears, etc. The fruit always reminds me of my uncle who adored it and always bought them in the fall when they could be found in the markets. For centuries, pomegranate juice, alone, or mixed with other fruit juice has been appreciated by those suffering from fevers or who lived in hot climates. The juice has been made into wine since antiquity, often mixed with other fruit juice. Grenadine syrup was originally made from pomegranate juice, sugar, and lemon juice and was, “much used in Europe”. By the 1920’s grenadine syrup no longer contained pomegranate in the U.S. While I look forward to the fruit, the blooms have put on an awesome spectacle we have watched quite intently. As pretty as they are, they are just one of many plants I am enjoying on the property. Every time I see a new array of colorful blooms open up I think about the previous owner choosing them, planting and caring for them, and enjoying their annual burst of color just as I am now. As I walk around the yard admiring first one and then another, and transplanting some of my favorites from my previous garden, I can almost sense her doing the same. I’m blessed and honored to enjoy the fruits of her labor and to care for them during the coming years. The flowers are a delightful reminder that the home has known love and joy from the first day the Raines family moved into it which somehow carries over adding to the immense joy we get from it now. Our quest for materials for the updating we’re doing to the new homestead continues, and we have learned some valuable lessons along the way. Perhaps the most important is, don’t believe advertisements – ever…, well practically ever. While Home Depot and Lowe’s would like us to think they are there for our DIY needs, the truth is, they’re there to sell in bulk to contractors and unless you know exactly what you’re doing and all the pros and cons of the different materials before you walk in the door, you’re better off looking elsewhere. We are NOT professionals, and do not have an unlimited supply of cash for the work we’re doing. While we have limited experience, we do possess an above average intelligence and excellent research skills so we’re capable of researching a point to death. That means we have already done our homework before buying materials so when we ask a sales associate a question, and said sales associate has no clue and either blows us off or tries to go online to find an answer to the question while we’re standing there we are not impressed. Anyone selling a product should know the product. Case in point – we were ready to put carpet in the master bedroom and tile the kitchen, dining room, and hallway and went to Lowe’s to look at tile and carpet. We had three sales associates who could not answer our question. The last of the three told us he would send someone to measure and that they would talk with us, give us answers to our questions, and we could decide whether to have Lowe’s install the flooring or do it ourselves. NOT. We all know where this is going – as we expected, the guy who came to measure was not a Lowe’s employee, but an employee of a sub-contractor who does guess what? Installs flooring. To answer our questions meant we might just not need their services so they weren’t about to answer anything. Also not surprising, the estimate they gave us for installing the carpet was way too much. Martin pulled out his trusty smart phone and typed in “flooring store” to see if we could get any better service at a local independent company. The first one we looked for was no longer in business. The second we looked for was Wilson Flooring. We were impressed beyond belief with the service, price, and quality they offered. We ended up getting just what we wanted (that Lowes had talked us out of), at a price we could afford, and installation within a week. They did what they said they would do, at the price they agreed to, and they did it when they said they would – with a cheerful attitude. PERFECT. The Mom-and-Pop store may just still be the best deal in town. The flip side of the story is that we’ve decided to install the tile ourselves although we do not have the necessary saw. Another internet search told me the big-box stores rent tools for DIY projects. NOT. Lowes said they do not rent tools and Home Depot said the closest store that does rentals is some 60 miles away. Again, it was a smaller, local, and more user-friendly store that can provide what we need – and will reserve it for us when we need it. My biggest complaint with big-box stores has been sour attitude on the part of the sales associates. For so many of them, we’ve found that huddling together to discuss football scores or rapid-fire texting is far more important than assisting a customer and because of that I have adopted the, “If you won’t assist me, then I will find someone who will” attitude. I am not going to plead with someone for information or argue with them about what I want and I darn well am not going to give them my address, phone number, and email address to sell online just to get them to answer a simple yes or no question. Finally, if the store isn’t going to train the sales associates, it wouldn’t hurt them to take some initiative and do a simple on-line crash course on the products they’re hired to sell. Work on the new place continues, but there is fortunately a light at the end of the tunnel. Martin took out cabinets we don’t need in the dining room and moved them to the laundry room. 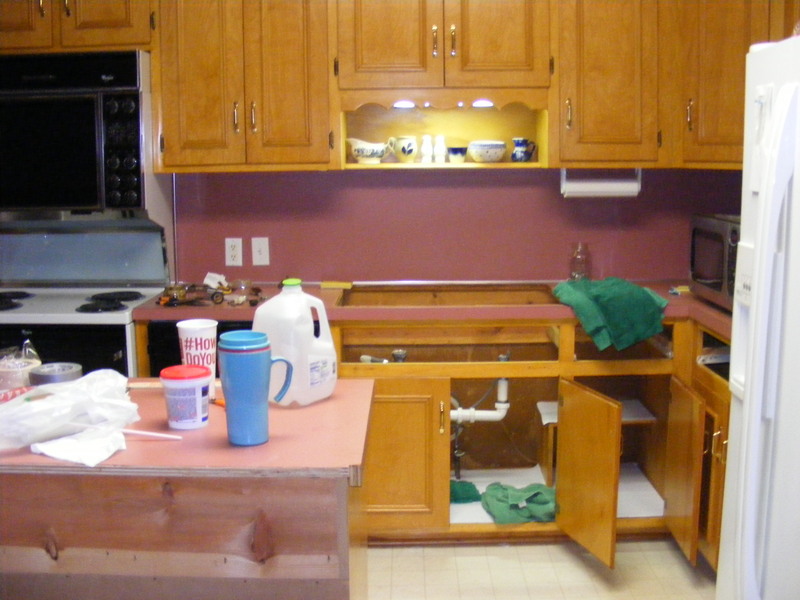 He took out a base cabinet in the kitchen and moved it in by 3 feet to make an island and open up a hallway, and moved the top cabinets that were over those to the laundry room to hang over the ones taken out of the dining room. It was old-school switcheroo but we love the end result. 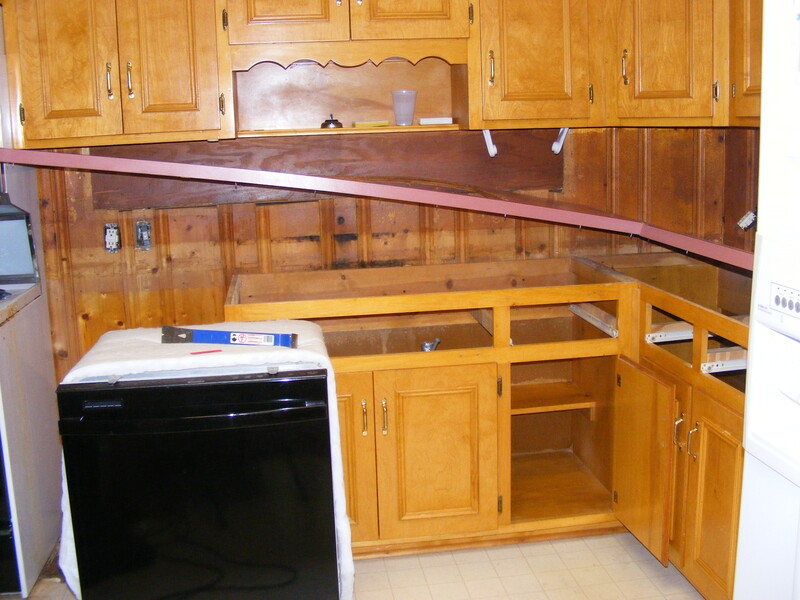 Antique pieces will fit into the spaces freed up in the dining room with the removal of those cabinets. He replaced the counter top and back-splash, which unexpectedly necessitated moving all the outlets and switches on the walls over the counter tops. The counter top that we removed butted up flush against the wall, but the one we replaced it with had a 4 inch back-splash that covered the bottom half of the plugs and outlets. 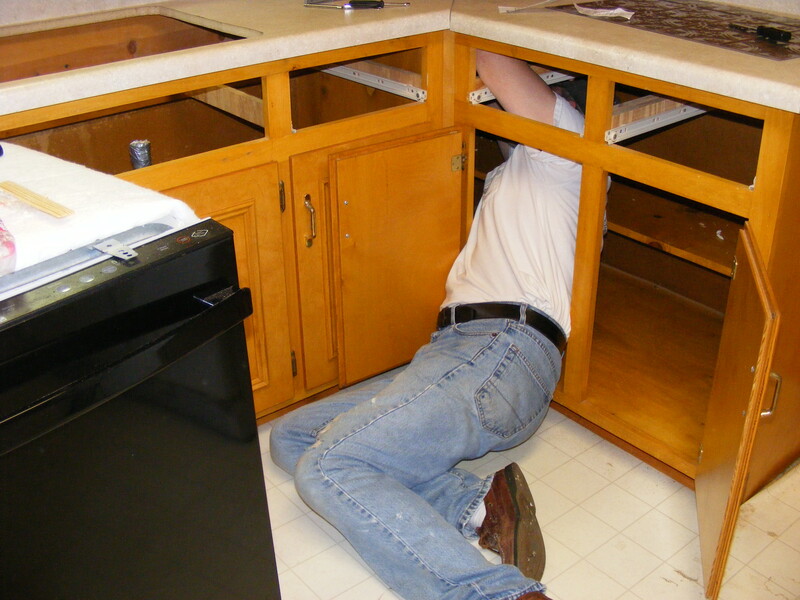 Once the outlets were replaced, he installed tin tiles from the 4 inch back splash to the bottom of the upper cabinets. It was loads of fun measuring and re-measuring where to cut the hole for the sink given the difference in where the base of the counter top sat in relation to the wall with the added 4 in. back splash. It was completely worth it the extra time it took to adjust everything because I LOVE the new look. It lightened up the kitchen and gave us the vintage look we like. We used the same sink but installed a new vintage-style faucet that complements the new look. The painting (including windows, facings and trim, the inside of closets and the laundry room cabinets) is about finished except I still have two bathrooms to paint. With the master bathroom paint job, the last vestiges of the pink that at first put us off from buying the place will be banished forever and replaced with a palette of sunny yellows, greens, and wood tones. The next project is refinishing the hardwood floors we found under ugly pink carpeting in the living room and we are also refinishing the hardwood in the two smaller bedrooms. 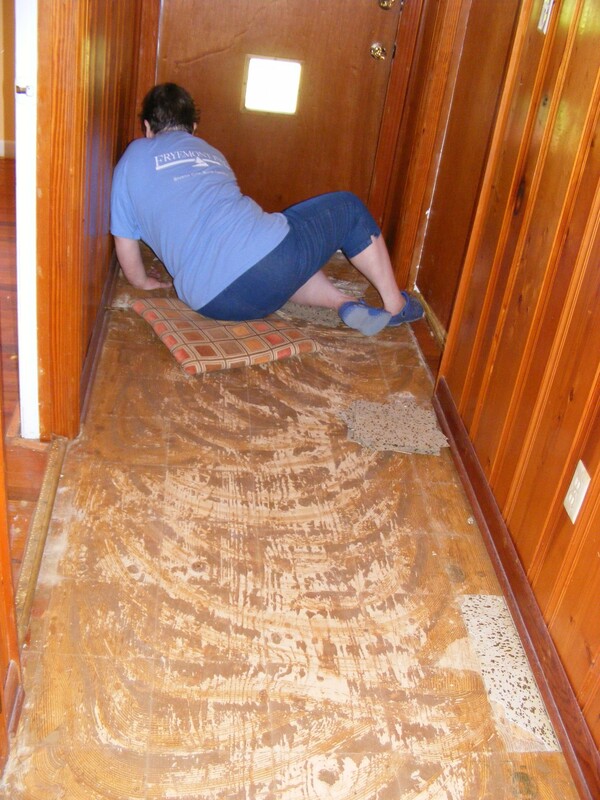 After finding the hardwood in the living room you should have seen how fast we dashed into those bedrooms to peek under that carpet! 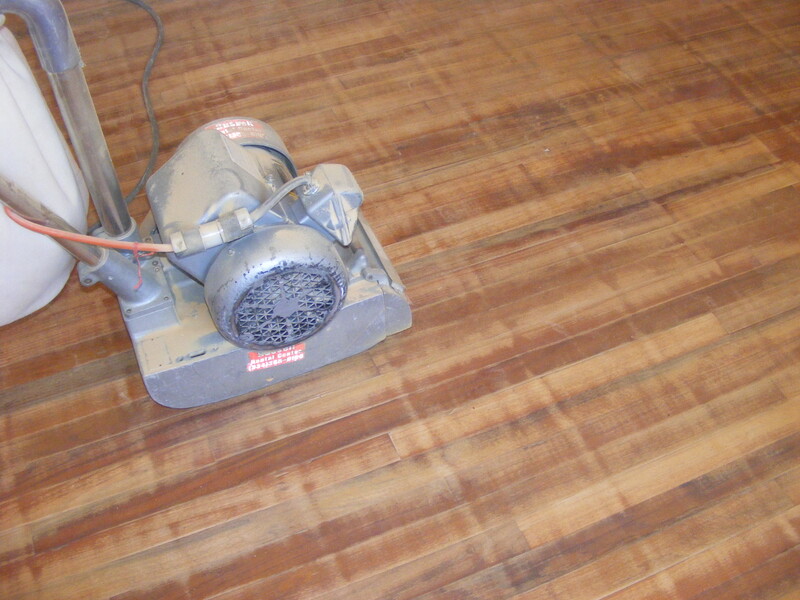 Finishing the hardwood will eat up a full weekend but then we will have beautiful wood floors. If all goes well, we will tile the kitchen and dining room the weekend after and then we can slow down and tweak little details over time. My next project will be to hang custom window treatments throughout – either curtains of fabric too nice to discard that are refashioned to fit different sized windows in the new house or made from scratch for the remaining rooms. Every room will have a different type of curtain and fabrics will be different patterns, but in the same yellow, green, and cottage white color scheme. Martin has tackled every aspect of the remodel with an open mind and has done an absolutely remarkable job. It has sometimes meant buying tools, or renting tools such as the floor sander for the hardwood or the wet saw for the porcelain tile we’ll be putting down, and sometimes we spent time online researching the best materials for our lifestyle or deciding the best way of doing something, but we are on the downhill stretch and I simply love everything he’s done. I am going to have the nicest kitchen I’ve ever had. The work he’s done means so much because he will be the first to say he isn’t experienced at this kind of work, but he’s done it and done it well. We fell in love with the place, but most of the interior of the house was pink (including pink counter tops) and we’re just not pink kind of people. We are so thankful we bought it because we love the place more every day and the house is going to be exactly what we want. You can’t get the kind of attention we’ve put into this house from a building professional you have to love it enough to put your heart and soul into it. Last night I made a meal that said, “Thank you, I love you”. I stuffed catfish fillets with crab meat, seasoned it up with the same attention to detail that my Love has put into the house, and served them with cheese grits topped with roasted cherry tomatoes. I made crab cakes out of the remainder of the crab meat which are in the fridge waiting to be the star of tonight’s meal along with the rest of those Heavenly roasted tomatoes. I am thankful every day for someone in my life who shares my interests and who I can laugh with even when working our fingers to the bone. At the end of the day, I know he loves me even when I’m covered in drops and splotches of two colors of paint and sporting a big glop of it in my hair. (Don’t ask me how that happened). Life is good. No, Life is Great.